Newest food town my tush. We’re here, we’re delicious, get used to it. Need proof? The James Beard Award Nominees are out and our fair city made quite the impression. Well, that statement is sort of misleading. You know that annoying saying, that D.C. is Hollywood for ugly people? Well it looks like D.C. is Eataly for media folks. We don’t necessarily know how to cook, but we sure do have a lot to say about those who do cook. I guess in a town of politicians and lawyers that’s to be expected. While I may be exaggerating just a touch, there were plenty of D.C.-based writers and television shows that were singled out this year. Tim Carman of the Washington City Paper was nominated for the best “Food-Related Columns and Commentary” and though he is no longer with the City Paper, I’m sure they will be more than happy to forward his award-related mail to The Washington Post. Or maybe they’ll keep it hostage, since The Washington Post was nominated for their own award for “Food Section of General Interest” which in my personal opinion sounds like the most boring category to be nominated in. And I love food and general interests! Proving that silly saying about being the ugly Hollywood wrong, D.C. got some props for some visual media this year too. A 60 Minutes feature on Jose Andres (more from him later) was nominated for “Best Television Segment”, though I’m thinking that host Anderson Cooper and his perfectly coiffed ‘do might have something to do with that. The most baffling of the D.C.-related nominations goes to Top Chef’s D.C. season and its nomination for “Best Television Program.” I (and most of the Internet) wasn’t exactly a fan, but I’ll take a nomination where I can get it, so…bring it home, Padma! There were nominations for actual cooking this year, not to worry. The only national chef or restaurant nomination was for “Outstanding Chef”, and went to our old friend Jose Andres of Minibar. We fared a little better when the categories were broken down by region, with three local chefs vying for Best Chef (Mid-Atlantic). Repeat nominees Cathal Armstrong of Restaurant Eve, Johnny Monis of Komi and Peter Pastan of Obelisk will compete for the award, while Bryan Voltaggio of Volt is noticeably absent from this year’s list. Last but not certainly not least, I’m most excited about Dogfish Head Brewery’s nomination for “Outstanding Wine & Spirit Professional.” Milton, Delaware in the house! 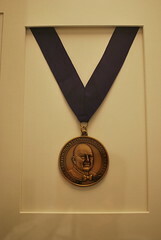 A full list of all the James Beard Award nominees can be found here. The awards will be given out on May 9th in New York City.